The traditional method of straightening teeth involved conspicuous metal braces with uncomfortable wires and brackets. Treatment time could last up to a couple years, depending on the case. Luckily, a modern system makes straightening teeth fast, comfortable and discreet. Invisalign, the clear alternative to metal braces, is embraced by individuals that want to improve their smiles. Dr. Samir Ayoub offers treatment with the Invisalign system at his San Francisco dental practice. To qualify for treatment, you must have all of your permanent teeth. Invisalign is not recommended for children that are still losing their baby teeth. Dr. Ayoub can evaluate you for treatment with Invisalign during a one-on-one consultation at his office. If Invisalign is not right for you, he can suggest alternatives. Please call us today to make an appointment to discuss your options. Invisalign uses a series of clear, removable plastic aligners to gradually shift your teeth into the desired position. The first step is for Dr. Ayoub to collect some information about the current position of your teeth. He will take a series of photos and impressions of your mouth, and use this information to create a three-dimensional guide of how your teeth can be incrementally moved into the desired position. This data helps create a series of custom-made aligners constructed for your specific needs. You will receive an upper and a lower aligner to wear. Once your first set of aligners is ready, you should wear them as much as possible, removing them only to eat, drink and clean them. 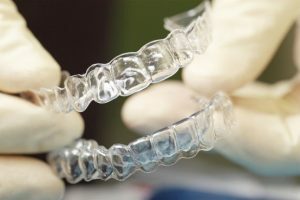 Invisalign aligners are thin and should fit securely and feel comfortable. They should be worn at least 20-22 hours per day for optimal results. You will see Dr. Ayoub regularly so he can monitor your progress and dispense the next set of aligners. The order in which you wear the aligners is very specific and important. In total, you will wear between 20 and 30 different aligners. Treatment usually takes about a year, although this varies by patient and the specific alignment problem. Patients love the Invisalign system for many reasons. First and foremost, because the aligners are so discreet, nobody knows they are in place. They can be easily removed for cleaning and they are more comfortable than metal braces (there are no wires that can scratch the inside of the cheeks or tongue). In addition, total treatment time is usually shorter than that of traditional orthodontics. To learn more about how Invisalign can quickly and inconspicuously straighten your teeth and improve your smile, please make an appointment with Dr. Ayoub. You can reach our office by calling (415) 781-2227.